The UEL Group welcomes the decision on July 14 of the Court of Appeal of Ivano-Frankivsk region which has found journalist and blogger Ruslan Kotsaba not guilty of high treason to be released from custody. Kotsaba, who spent 1,5 years in prison, was the first Ukrainian prisoner of conscience under the new government as recognized by Amnesty International. 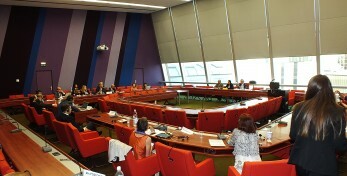 During the III part session of PACE, 21 Members of PACE called for “immediate release of Ruslan Kotsaba, his recognition as a conscientious objector and the repeal of the judgment” in the written declaration “Defend the freedom of Ruslan Kotsaba imprisoned in Ukraine” initiated by the UEL Group. This arrest is a clear example of the violation of article 10 of the European Convention on Human Rights which guarantees the freedom of expression. In January 2015 Kotsaba has recorded a video message to the President of Ukraine, Petro Poroshenko named “I refuse mobilization” where he asks not to be sent a letter for military mobilization and declares that he would rather go to serve a prison sentence, than killing his compatriots.